In the western side the intervening ground between the inner fosse and outer vallum widens into a broad platform. The position of this stronghold is the centre of many surrounding camps, and communication could easily be made with those at Lambley on the south; Lowdham and Thurgarton on the east; Epperstone and Oxton on the north; and the two in the parish of Arnold in the west. 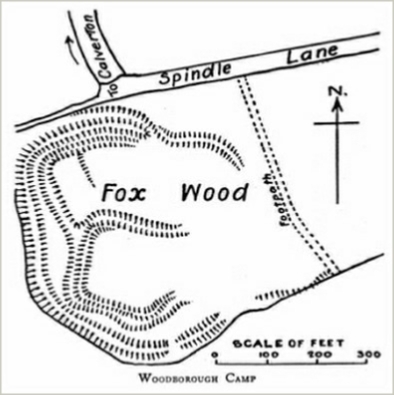 Seven miles north-east from Nottingham and half a mile south of Calverton is Fox Wood, in which is one of the most interesting earthworks of the county. It is a matter of regret that destructive forces have shorn it of its original size and plan. The swell of the ground gives a prominence to the site. At present the remains are somewhat oval in form. The strongest position, approaching a square, has three sides of a vallum [a Roman rampart or earthwork] and fosse [a ditch or moat, especially one dug as a fortification]; but on the eastern side they begin to curve outwards into another court, which possibly provided a well-defended entrance into this innermost area. On the north is another court with the fosse remaining on the north and west sides; at the north-east the defence changes into a vallum which apparently, by the progress of its line, joined the northern entrenchments of the inner court; but the eastern side is lost. From the middle of the northern side a strong vallum, embracing all the inner works, passes around the western and southern sides, at the extremity of which latter it is destroyed; this entrenchment is probably older than the interior works. At the middle-north point is an entrance, difficult of access; the agger [a Roman word for an embankment or rampart] is here incurved, while another rampart, taking the same curve outwardly, forms a sunken approach, which for 180 ft even in its mutilated state could be covered by a cross-fire from both sides.